Knowing that a big polar bear conservation meeting is coming up, it’s pretty clear that most of this propaganda is politically motivated. 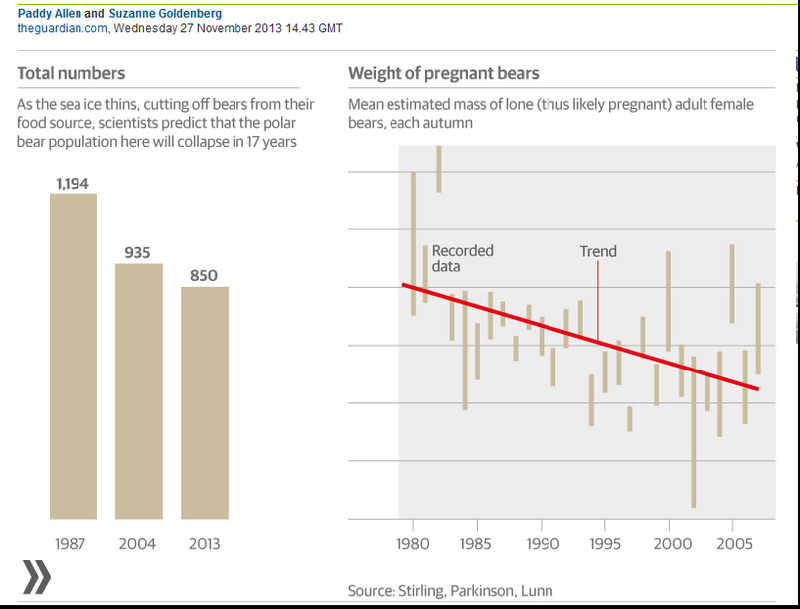 Finally, Goldenberg gets to the guts of her story: she highlights previously unreported data given to her by activist polar bear researchers who work in Western Hudson Bay with some fancy graphics (a couple of them copied below). 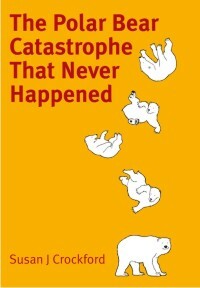 “One single polar bear population on the western shore of Hudson Bay, for example, has shrunk by nearly 10% to 850 bears in under a decade, according to the latest Canadian government estimate seen by the Guardian. Figure 1. On the left, the Western Hudson Bay population estimate for 2013 (“850”) is unsubstantiated – is this based on actual counts or a computer modeled projection? Goldenberg does not say. On the right (“mean estimated mass of lone adult female bears”), note that while the data presented goes to 2007 (6 years out of date), in fact the only published data available goes to 2004: the rest is from “Lunn and Stirling, unpublished data.” Click to enlarge. 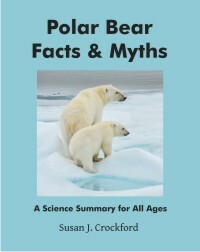 I’ve addressed this issued of polar bear researchers withholding data before, see “Critical evidence on polar bears in Hudson Bay is unpublished.” The truth is, there is no recently published data on estimated mass (i.e. weight) of female polar bears, litter sizes or survival of cubs in Hudson Bay, so no one knows whether what Stirling and Lunn are saying is actually backed up by solid data or not. Is the new population estimate based on actual data collected between 2004 and 2013 or is it the result of yet another model that incorporates some old data and “projects” the rest? There is no way to know at this point, because no one has seen the full government report. A projection of future sea ice based on data that’s thirteen years out of date (or even 7 years) is not science, it’s propaganda. Figure 2. A fanciful projection of the ice-free season in Hudson Bay, based on 13 year old data (the observations – i.e., “recorded” – end in the year 2000). This kind of data manipulation is dishonest and totally unscientific but Canadian polar bear researchers Ian Stirling, Andrew Derocher and Nick Lunn not only endorse this kind of garbage but they’ve done it before. Click to enlarge. 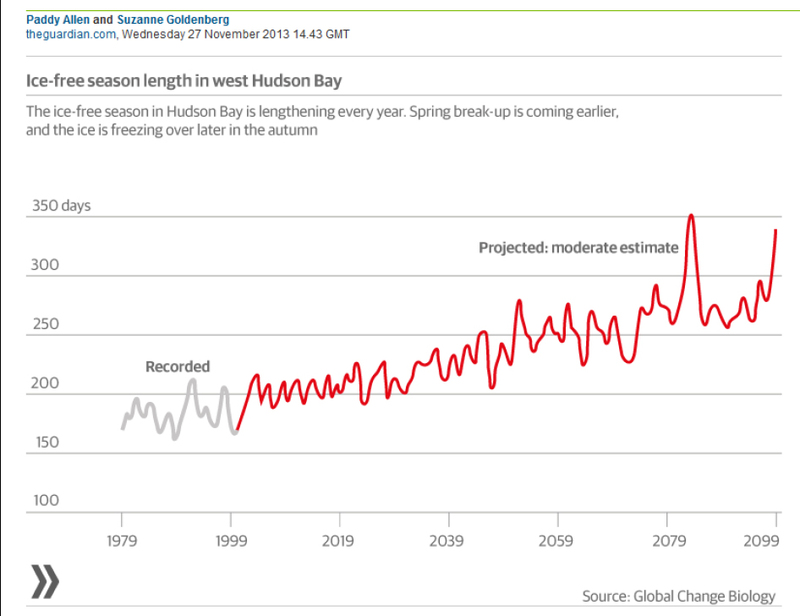 It doesn’t matter how often Suzanne Goldenberg keeps repeating the lie that the ice-free season in Hudson Bay is steadily lengthening – it doesn’t make it so, even if polar bear experts are the source of the information. What are these guys thinking? It’s better to get in bed with an activist environmental reporter who can generate headlines than to publish the data and let it speak for itself? Show us the starving Hudson Bay bears! Show us the Western Hudson Bay polar bear data that supposedly makes your case so strong we should revamp the world’s economy to save the bears from “collapse”! Why are polar bear researchers still withholding data, if the stakes are so high? 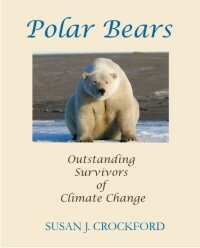 This entry was posted in Advocacy, Conservation Status, Sea ice habitat and tagged Amstrup, breakup, climate change, conservation, death rates, Derocher, Environment minister, freeze-up, Goldenberg, Hudson Bay, melting ice, Nick Lunn, open-water season, polar bear, starving polar bears, Stirling, western hudson bay. Bookmark the permalink.